You love ice cream and hate broccoli. This is a classic childhood scenario at its best. And now – gamers will be able to fight for their love of their favourite desert in the upcoming Wii U eShop title – Ice Cream Surfer. According to recently spotted rating listings on PEGI and the USK, Barcelona based studio Dolores Entertainment is bringing its PC and iOS game to the Wii U eShop in the near future. The title is a 16-bit side-scrolling shooter, which sees players travelling through a sweet and savoury universe fighting an evil broccoli and his army of vegetables. Ice Cream Surfer offers five characters to select from including; Ace, Sailor Twister, Super Cream, Rei Tou and Hima – each with their own special abilities. In addition to this, there’ll be “epic bosses” to fight at the end of each world. Why would a load of vegetables want to stop you eating ice cream, and eat vegetables instead? When they're vegetables. They want to you eat them. Looks like I will be getting this due to the lack of options for the genre at the moment on the Wii U. This look intresting, I may get it depending on reviews. I sometimes wonder, how difficult is it to put at least a little effort in a game? @Octane Have you ever made a game? This premise (scenario, not gameplay) sounds like the exact opposite of Kickle Cubicle. That is the only reason I clicked the link. Game doesn't sound like my thing, though. @deKay So unless we made a game we can't be critical of how this one looks? I get the whole '16 bit', but this one looks like it could be a flash game playable in our browser, and personally I had enough of this 'retro' mania. This games only exists for 1 reason, so when people talk about "indies" they can say: "for every Shovel Knight, there's an Ice Cream Surfer". @deKay Actually, yes. Just for personal use, with the aid of Game Maker. But that shouldn't matter, as I don't have to be a movie director to have an opinion on a particular movie. This game doesn't look that difficult to make, I guess anyone with a little experience could make this within a week. If a game is good, it is good; If it's terrible, it's terrible. Being an ''indie'' game isn't an excuse for poor quality. I like ice cream and hate broccoli. But I'd eat an entire bowl of broccoli before playing this. Bleh. I fully expect he hasn't because they have clearly put a lot of effort into this game. It may not be everyone's cup of tea but it isn't just some micro-transaction or ad riddled iOS game that was slapped together in a week. @andrea987 That wasn't what I meant. I was responding to "how difficult is it to put at least a little effort in a game". If you've made a game, you'd know. If you think anyone with a little experience could make this in a week then you are crazy and you are doing these guys an injustice. This clearly isn't some sh*tty Flappy Bird clone that was churned out in a week so the devs could make a quick buck on a game riddled with ads and micro-transactions (Edit: Well not the version we are seeing in the trailer). Also, while you may not like the look of this game I'm not seeing any solid evidence that it's actually a bad game at this stage. It looks like a pretty solid shoot em up. Nothing particularly special, although the ice cream theme is a wee bit novel at least, but that doesn't automatically make it a terrible game. @Octane Sure, it doesn't look all that great, but there's clearly a lot of effort put in. @Octane So you already played it? I don't think this looks THAT bad. We've got a lot of things coming up on Wii U, but no other "space" shooters that I can think of. It could be all right. Not the best trailer, but the game isn't necessarily garbage just for that. But... I don't understand why they would be fighting a cake. Shouldn't cake be on their side? This could be fun, who knows. Still if you're desperate for a great shooter, check out the Turbo Duo selection on the Wii Virtual Console. Gate of Thunder/ Lord of Thunder/ Dead Moon/ Air Zonk/ Super Air Zonk/ Gradius 2 all great games! Not going to lecture people here about 'saving the universe' through food choices, but you should see what's making me confused, no? @Shambo Plot twist: The ice cream side is actually veggies in ice cream suits. While the veggie side is actually ice cream in veggie suits. See, this is the type of imagination i can get behind. A kid surfing on a flying Ice Cream cone while being chased by killer vegetables, this is NES-era type stuff no doubt, which i love. And i'll admit, The art work and game title had me excited....Until i saw the footage in action. pukes. terrible art direction all around, with game play that looks better suited on an I-Phone. as the sheep would say, "BAHHHHHH-DDDDDD!!!" Hahahaha Save the universe.....from veggies! LOL The concept is totally left field, yet welcomed! @Kirk The ice cream doesn't make it terrible, it's the gameplay itself. It's a simple shooter. The coding for that can be written in under an hour, further, there's some simple animations, but that's about it. The artwork might take week, but in all honestly, it's really not that difficult. I bet that anyone with a little experience in making games, is able to produce this. It's a simple copy of another sidescrolling shooter without much depth. If they have been working on this for several months, I honestly wonder what they've been wasting their time on. I have to presume you've never actually made a game in your life because you clearly assume this game is a lot simpler than it actually is. I like it. I give me vibes of Parodius. I'll totally get it. Plus, OMG, an actual shooter on WiiU! Heck yeah! @Kirk You're free to presume anything you want, but at least elaborate yourself, and explain why this game isn't a simple knock off from every other sidescrolling shooter. It's a sidescrolling shooter, the sprites don't use more than 4 images, and all you do is collect gems, which are translated into a score. The artwork isn't great, we've seen the gameplay before. The only thing that makes this game slightly interesting/unique is the ice cream vs. vegetables theme, but even that gets thrown out of the window as soon as the game starts and becomes completely irrelevant. Funny that no one mentioned that the evil broccoli is actually a Hitler caricature, playing on the idea of forcing kids to eat veggies because he was a vegetarian. I like the concept, but the overall the game looks like an ice cream covered turd. It's similar to a lot of other shoot em ups in that respect and I can tell you that most of these games take a lot longer than a week or so to make, even in tools like Game Maker, unless they really are just hollow shells that maybe look mostly solid and polished at a glance but are buggy and rough as hell in reality, which this game does not look to be. It looks like a proper, polished and complete game. It's easy to slap what looks like a game together in a week in Game Maker, basically a prototype or concept for a proper game, but it's a lot harder to actually make a game that isn't basically a pile of clunky buggy sh*t that only exists to force ads or micro-transactions on you for a quick buck ['you' usually being stupid ignorant casuals who don't know any better and will play anything as long as it's free] and this game doesn't look like that's what it is at all imo (Edit: Well not this console version as we are supposedly seeing in the trailer anyway). It may not be the best shoot em up ever, I'm in now way claiming it is or even that it's even that good, but I can tell you with a decent level of confidence that this game probably took at least a couple of months to make, test and polish to get to the final version (Edit: The one we are seeing in that trailer). Shovel knight is the only indie game i'm looking forward to. It looks authentic and easily a head of the pack. Not even inafune's mighty n.9 can touch it, at least based on where the game's at in it's development cycle....looks and plays very disappointing imo. Barren mechanical and lifeless environments, PS2-like animation and visuals, clunky controls, ect....I seriously wish Mighty N.9 would just be a new Mega man sequel instead. I backed it up with $75 kickstarter too. eek. Got to like the brocoli fro. Wow I'm old school and won't go near this game. @Kirk From the single IOS review I could find online it seems that it is broken but I agree,it surely took them more than a week to put it together. "To top it off, the game frequently crashes, experiences inexplicably long load times, and generally feels unfinished. 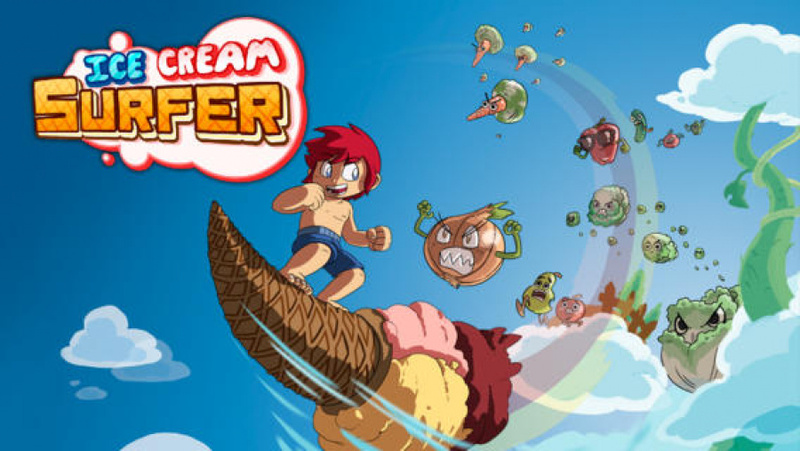 Ice Cream Surfer has serious problems, problems that make it not worth recommending despite the endearing graphics. But, it isn’t unfixable. Here’s hoping this one gets another scoop"
Ok, I owe both you guys an apology here and I'm willing to admit when I'm wrong. I just tried downloading the demo of this game from the Steam Greenlight page, that I found doing a quick Google search, and, well, if you want to try it out you can do so yourselves but I would not recommend it. I couldn't even get into any of the levels and it basically crashed my machine. So, my apologies for actually defending these guys and Sorry. Now, just to add a final word that although CLEARLY this demo is a pile of sh*t I still don't think what we are seeing in that promo video is reflected in this demo because CLEARLY the game must be playable based on the fact there's actually reviews out there. Also there's no chance the game could even remotely come out on any consoles if it were as broken as the demo suggests, so there's got to be some problem with the demo itself. Although either way this version of the game is clearly not half as polished as how it appears in that trailer (other than the graphics which are actually half decent). I still however say the game we are seeing in the video took more than a week to make, assuming that video is footage of a real console game that actually exits and works as advertised in the video. Still, that demo changed my mind and turned around my entire opinion on the potential quality of this game. Yeah, ok, the iPhone game is pretty sh*t too and it does have popup ads and lots of micro-transactions. We can only hope the final console game has been tweaked drastically over both the totally broken Steam demo and the clunky iOS game. Lol: The premise sounds cool, but the graphics are a bit weak. Oh, man! They certainly how to be silly! Let men get this straight: Anapomorphic, masochistic vegetables have such low self-esteem that they want to force the galaxy to eat nothing but nasty veggies, at least until everyone dies from various nutrient deficiency diseases. Our only hope is a team-up between ice cream themed versions of a surfer kid, Sailor Moon, Superman, Kenshin Himura, and a yeti. Well, if the gameplay holds up, this could be in the category of so weird it actually works.